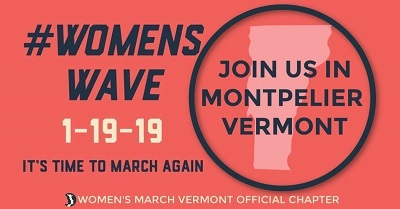 Women’s March Vermont announces a Women’s Rally in Montpelier in coordination with sister marches and rallies in cities and communities across the globe. The rally in Montpelier is one of thousands happening on January 19, 2019, commemorating the 2017 Women’s March on Washington. Participants will gather on the Statehouse lawn between 9:30-10:00 am. Speakers and performers will begin promptly at 10:00 am and will end around noon. Featured speakers include Kiah Morris, Dr. Mariko Silver, Dayle Sargeant, Melody Walker Brook, Brenda Churchill, Krista Scruggs,Tabitha Pohl-Moore, Amanda Garces, Sarah Launderville, Caroline Whiddon,Freweyni Adugnia, Beverly Little Thunder and MacKenzie Murdoch along with a musical performance by Patti Casey. In addition to hearing from these inspirational women, Women’s March Vermont will be announcing the Women’s Agenda — a progressive and expansive set of federal policy demands as well as highlighting local progressive legislative initiatives that attendees can support. Find more information on social media @womensmarchvt. Burlington’s Peace and Justice Center is coordinating buses to the national march in DC. The bus departs from Burlington and makes a stop in Fair Haven. Tickets are $125 but are free for high school students and there is scholarship available for those in need.